This is a great post by my colleague Jan-Erik Asplund. I recommend following him on Twitter for more smart stuff like this. The insights that Chris [Savage] conveys in the posts don’t run aggressively counter to your average lines of thinking on leadership or work. But each title above takes that core insight and stretches it around a lazy, familiar concept that we all think we know. By framing the insight against those familiar terms, it becomes more important—and makes us want to click. This is a classic Morgan Housel post. 3. Spotify vs Apple Music vs Pandora: Who Is Growing Faster and Why? 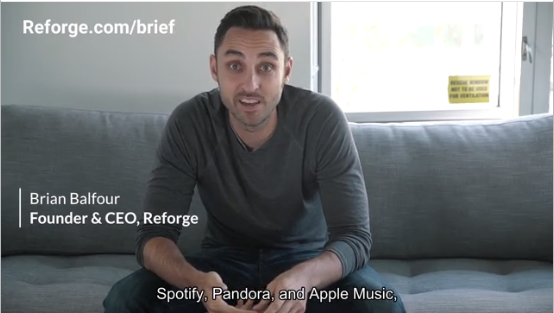 Reforge’s Brian Balfour has been posting some really interesting videos on LinkedIn recently. This one explores the difference between using freemium and free trial models for the world’s top music services. Speaking of Reforge, here’s Head of Marketing Susan Su on her career path. Our outer reality is a direct effect of our inner thoughts. Many of us now know that confidence begets winning, not the other way around, but we forget that we can control and generate that confidence with our own thoughts and the deeds that spring from them. If you want to grow in your career, start by embracing the capable, charismatic winner inside—and then give her a doorway so that she can step out and shine. Starbucks may have oversaturated the US market. They’ve opened 5.5 stores per day for the last five years. Watching Bill Burr on the Conan O’Brien Show is an easy way to kill many hours on the internet.